The worst mass transit disaster in Seattle history was unlike anything before it. An amphibious vehicle full of tourists broke an axle and rammed into a motor coach full of sightseeing international students. Three and half years later, 40 of the victims of the crash represented by Stritmatter Firm trial counsel obtained a record-setting $123 million verdict. These are the stories of the unimaginable carnage and loss, and the civil justice system at work. For more on the Ride the Ducks case and trial, see our Ride the Ducks page. Just minutes after the first firefighter arrived, officials declared the crash an “MCI—Mass Casualty Incident.” An MCI is an event where first responders are forced to suspend normal operations, such as normal recordkeeping, because there are too many victims to treat. Patients need to be triaged—sorted based on the severity of their injuries. Pictured: Overview of crash scene from helicopter, with patient triage count. Not included in count were a dozen or so more passengers with minor physical injuries, who were eventually transported back to school, reeling from the shock of what happened to their classmates. This was the largest Mass Casualty Incident involving transportation in Seattle history. Seattle Fire and Seattle Police quickly established traffic corridors on the bridge to assure access of ambulances to and from the crash site. The Seattle Fire Department began to triage – determining which patients were most severely injured so they could be transported to Harborview Medical Center, a Level 1 Trauma Center. Heartbreaking decisions needed to be made. If a paramedic felt a patient would not survive an ambulance ride, that person would stay while the ambulance took the next seriously injured patient who could survive. Swedish, Virginia Mason, and Northwest Hospitals absorbed the less critically injured victims. 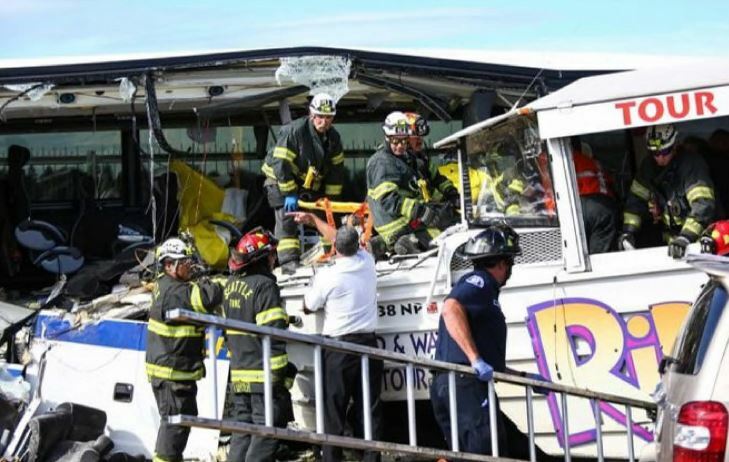 Some victims had to be extricated from the wreckage—trapped under bent metal seats. Firefighters used sawzalls and other devices to get these passengers to safety. Due to the triage and chaos, family members were separated and sent to different hospitals. Many had no way to reach one another for up to a day. Some did not if their family members survived. Many crash victims were 18 years old, just starting college in a foreign country. More than half were not fluent in English. First responders struggled to contact next of kin.